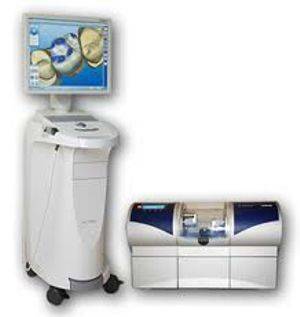 The Cerec system is one of the most significant developments in dentistry as it brings dentistry firmly into the digital age. It is a CAD/CAM system (Computer aided design and manufacture). Gone are the impressions, the plaster casts and the long waits for a laboratory made crown. A Cerec is made and fitted on the day of preparation. 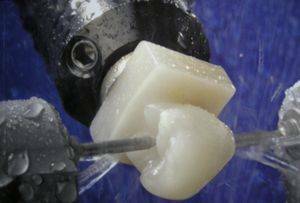 As Cerec can be made immediately, it means that weaker side walls of the tooth can be left that would not survive the chewing forces in the time required for a standard crown to be made. The Ceramic Cerec uses, actually makes a tooth stronger once bonded including these fragile sections. This, in turn means less drilling away of healthy tooth as well as a more durable result. Investing in this system it keeps this practice at the forefront of preventative minimally invasive dentistry in the area. We are experienced in its use after installing the system in 2007. We complete all aspects of its use doing simple back teeth to comprehensive cosmetic smile-make over veneers, crowns and bridges. A powerful PC is required to do the number crunching to process the scanned images into a “stitched” 3D image. Then for the calculations needed to create the required new “tooth-part” and control a milling unit to cut a ceramic to shape. 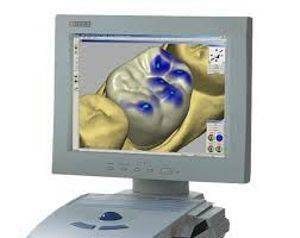 The Cerec camera is a technological marvel, using the parallax principle in its images to show the height and shape of structures. The 3D images achieve an incredible accuracy with resolution of 19μm, much more accurate than any plaster cast. The Milling unit the cuts the shape designed by your dentist out of a block of solid industrial ceramic. The milling unit is fast cutting a single tooth in approximately 11 minutes and also very accurate achieving a tolerance of ± 25 μm . Also being computer controlled it never has a bad day and eliminates human error. The Ceramic itself is the real key to the value of the system however. As with most repairs the closer you get to repairing “like with like” the better the repair will be. For example if you weld in a new piece of metal to repair car body work that is better than filler. 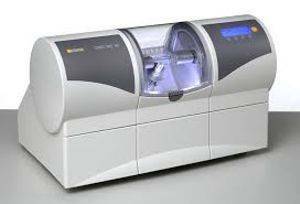 Cerec ceramic is made in industrial conditions as a solid block and is far denser with no imperfections compared to conventional incremental layer-on-layer build-ups on plaster models normally used to construct most laboratory made porcelain crowns. 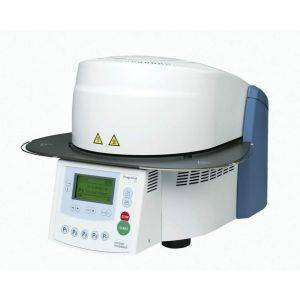 The vacuum porcelain furnace completes what is effectively an in-practice laboratory. 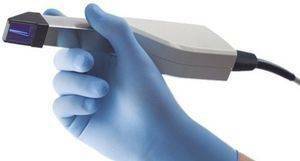 It enables the dentist to kiln-fire stains and glazes onto the surface of the Cerec ceramic and try them in whilst you are there and change them if necessary to get a perfect colour match to your teeth. Judge for yourself. 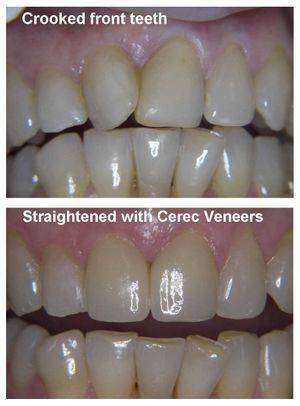 The pictures below are of one of our patients where the two front teeth have been treated with Cerec. Look closely as the join is actually above gum level. It is effectively invisible with no “black lines” as commonly seen on conventional crowns. Finally as it is solid ceramic there are no issues with biocompatibility. There are no plastics (apart from a very small amount in the thin film of adhesive). Simply put, it is the best tooth repair available at this time.